The team has gone their separate ways and Quake is trying to hunt down whoever killed Phil Coulson. How do I say this without being a horrible nasty critic? If Trouble Must Come had many things that were no good about it and few things that were actually good. Ah screw it, this was hot garbage. I've enjoyed the Inhuman movement overall and the ups have generally balanced the downs in the worst case scenarios, but this was dreadful. The story was all over and not particularly interesting. The characters were accurate enough, but they were largely unenjoyable. 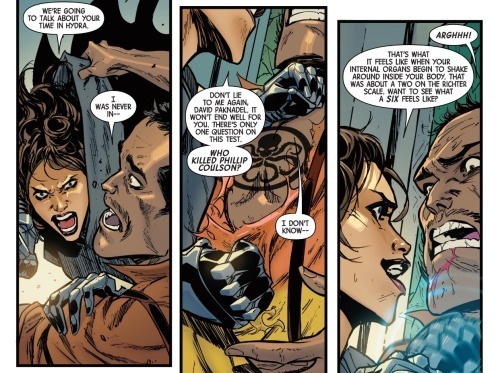 I generally really like Quake, Ms. Marvel, and Inferno but they were all annoying. I also really dislike this version of Karnak. The total nihilism is weary and seeing him be so disconnected was painful. In the end If Trouble Must Come was just bad.